2. Since no cadets signed up to shoot there will be no air rifle range on Thursday, April 24, 2014. 3. Drill Team practices are held every Monday night at the Pembroke Armoury from 1830-2030hrs unless otherwise stated. 4. Cadets are to see the Supply Officer (OCdt Alex McGinley) to sign for their name tags. 5. Some offers of participation for summer training have been received at the Squadron. As we receive them we will make cadets aware of what courses they have been selected for. Drop off and pick up is at the armoury. Wear pt clothing and running shoes and bring a water bottle. 7. There will be a special drill team practice this Saturday, May 3, 2014 at the Armoury. The practice will take place from 1000hrs to 1400hrs. Cadets should bring their lunch, water bottle, and any nut free snacks they may require. Cadets will be permitted to go to Pizza Pizza only if they prefer to bring money for lunch. Drill boots and wedges are mandatory. 8. We will be tagging on Friday, May 2, 2014, Saturday, May 3, 2014, and Sunday, May 4, 2014 in Pembroke and Petawawa. All cadets are required to participate in at least 1 three hour shift over the course of the weekend, however all cadets are encourage to sign up for more than one shift if possible. Every attempt will be made to accommodate selected shifts, but it may be necessary to reschedule some cadets in order to ensure that all locations are covered. 9. Reminder that next week we will be hosting our monthly CO’s Parade during third period. 10. 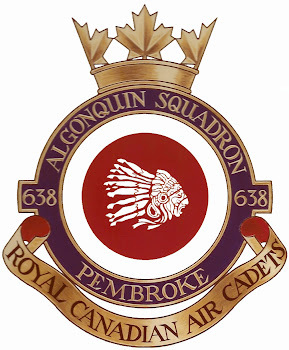 All upcoming events have been posted on the calendar on the Squadron’s blog (638squadron.blogspot.com).